Despite popular opinion, blow molding is science, not art. While many molders in the industry continue to rely on trial-and-error methods to refine mold and product designs, Regency Plastics utilizes cutting edge software to optimize part weight and tailor wall thickness of our customers’ parts. 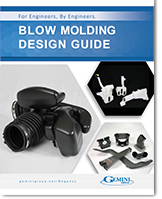 Our engineers’ decades of experience in blow molding is supplemented with state of the art blow molding simulation software that takes the guess work out of the design process. Existing industrial part got a 25% weight reduction, 10% cycle time reduction and quality improvement. New part debug time is reduced by 6-8 weeks.